One of the simplest, most flavorful sauces you can make on the fly to flavor just about any type of meat is a “gastrique”. A gastrique is a boiled sugar syrup deglazed with vinegar and flavored with your choice of spices, herbs, fruits, liqueur, etc. 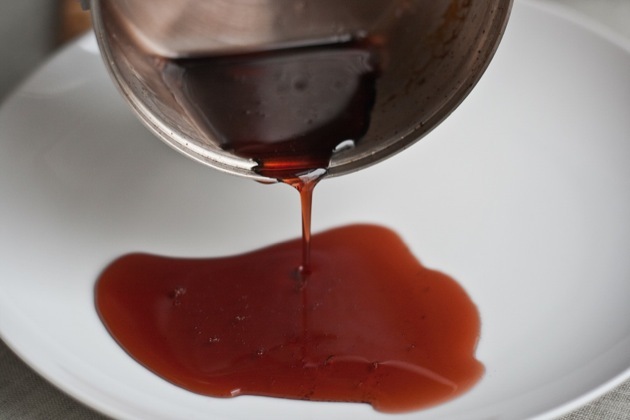 The sugar combines with the tang of the vinegar and makes a delicious syrup style sauce. You need to use a flavorful vinegar; a cider vinegar, red wine vinegar, champagne vinegar, etc and not common white household vinegar. Last night I grilled some chicken thighs and made a wonderful cranberry-rosemary gastrique to drizzle over the chicken. In a saucepan with a heavy bottom, add 1/4 cup sugar and 2 tbsp water. Your sugar should resemble wet sand. 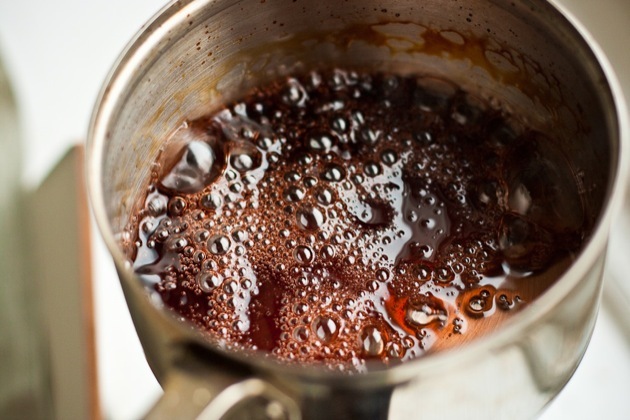 Cook over medium high heat until sugar dissolves and syrup boils, stirring constantly, to achieve a light brown color. The darker the syrup, the more flavorful the sauce. Be careful, this sugar syrup is extremely hot and will burn you if it bubbles out of the pot. Once the sugar syrup has achieved a nice nutty color, add 1/4 cup vinegar (I used red wine vinegar) all at once, so the hot syrup has less time to react to the liquid addition. The syrup with harden once the liquid is added to the pot, so keep cooking and stirring until the liquid begins to cook out and the syrup thickens enough to coat a spoon. This entry was posted in Sauces and tagged gastrique, meats, sauce, syrup, vinegar by quarlj01. Bookmark the permalink.